Last season even without Kellen Moore and a number of other important pieces the Broncos won 11 games. With the return of quarterback Joe Southwick and the maturity of a number of players the Broncos have the talent to be once more BCS busters. 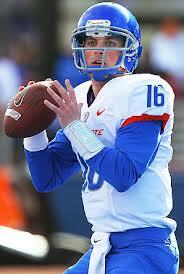 If they can get past a couple of tough Mountain West games a BCS bowl could still be on the horizon. didn't feel out pressure well. Those both should take big leaps in '13. The Broncos must replace D.J. Harper and his 15 touchdowns at the running back spot. Sophomore Jay Ajayi is the leading candidate to replace Harper. With Southwick more of a threat Boise won't have to lean too much on their ground game which is definitely a good thing for Ajayi. Freshman Aaron Baltazar and sophomore Jack Fields should get their fair share of carries. Receivers: Junior Matt Miller returns to make a fabulous duo with Southwick that should give defensive coordinators headaches. Miller was always a threat to make big plays after recording 66 receptions a year ago, averaging 11.7 yards per catch. He is a very psychical receiver who makes catches in traffic but also has the speed to beat defensive backs down the field. Senior Kirby Moore also returns after a strong season in 2012. He also makes plays in traffic but he doesn't have the home-run ability that Miller possesses at times. Another senior, Aaron Burks, will finally get the chance to prove himself after years of sitting on the bench. 5-10 junior Dallas Burroughs has game-breaking speed and has the potential to be the next big thing in Boise. Although he had some issues with drops last year he was pretty effective. The tight end position is in good hands with sophomore Holden Huff and senior Gabe Linehan. Both are important pieces to their teams as both are Southwick's security blankets. They have good hands and constantly pick up tough yards. Offensive Line: Throughout the years Boise has had great offensive lines, something that might change this season. Senior tackle Charles Leno returns after a great '12 year. He has great leadership abilities and is extremely athletic constantly able to move to pick up additional pass rushers. The only other returner on the line is senior center Matt Paradis. He is smart and can find and push around rushing tacklers and he was a big part of breaking in Southwick. Although there are some new starters on the line they are very experienced with two seniors, Jake Broyles and Spencer Gerke, starting at the guard spots. Both are big and great at opening up running lanes which should help develop Ajayi. Even with some good experience and proven studs in Paradis and Leno the Broncos don't have much depth so they will have to rely on some redshirts and upperclassmen. Defensive Line: This appears to be the real strength of the Boise State defense. Junior Demarcus Lawrence is one of the best pass rushers in the Mountain West and even the nation. Lawrence had 9.5 sacks in 2012 and he only played 11 games meaning that 9.5 should go up. He uses his very athletic body to constantly disrupt opposing squad's backfields. Another junior, Beau Martin, has the chance to start at the other end or maybe be a quality backup to Lawrence. With Lawrence wreaking havoc on the perimeter teams should struggle to run up the middle as well. Nose guard Ricky Tjong-A-Tjoe doesn't just have a cool name; he is also a great player. He can some backs from getting any easy yards but also is quick enough to get after them before they break the line after recording 4.5 tackles for loss a year ago. Sure to start alongside Tjong-A-Tjoe in the middle is junior Tyler Horn. Horn isn't proven yet though he definitely has the potential to be a great tackle. Linebackers: For years the Broncos have had some great linebackers and also are tough to run on. Their linebacker corps only includes two due to the way Pete Kwiatkowski runs his defense. Although J.C. Percy and Tommy Smith are both gone the Broncos have a ton of potential at these positions. Sophomore Tyler Gray has the potential to be a great player this year and for years to come. He is quick to the ball and has the chance to mature a lot in 2013. Junior Blake Renaud should also contribute. He also has a nose for the ball and is athletic enough to rack up a bunch of tackles. It appears coach Chris Petersen and staff will rely on a number of freshman to play a lot of snaps immediately. Outside linebacker Gabe Perez is extremely athletic and has the thick, solid frame to push around backs. California product Tanner Vallejo is a tackling machine and should make an impact right away. 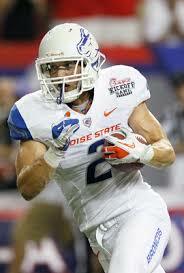 Secondary: It was tough to pass against Boise last season as the Broncos let up just 169.5 yards per game in 2012. That should continue this year with the return of a number of players including safety Jeremy Ioane who is the leading returning tackler this year and picked the ball off 3 times last season. Sophomore Darian Thompson was a great freshman a year ago and will also be tough to pass in the open field. Both Thompson and Ioane combined for 113 tackles in '12. The Broncos also have two great coverage defensive backs in sophomore Donte Deayon and junior Bryan Douglas. Both are quick and tough to beat down the field but they both have a big weakness. Both of these cornerbacks are 5-9 meaning that they can get pushed around by physical receivers and jump balls. Although this isn't the most talented Broncos team in Boise the fact remains that they are 61-5 the past five years and still are the best team in the Mountain West. This means once more Boise is a double-digit win squad that can find themselves in a great bowl.